Sue is out in the evenings a lot at the moment, helping out with the current production of Steel Magnolias at the Loft theatre. Sunday, however, is a night off, so I thought I’d push the boat out and cook two things from The Prawn Cocktail Years for dinner. Spaghetti Bolognese, followed by Oranges in Caramel for dessert. Things kick off the evening before. It’s Saturday night, and I’m home alone as Sue is at the theatre, so I figure this is a good time to get the oranges in caramel out of the way. I’ve made this a good few times before; it’s pretty easy to make, and it is delicious. You need to start with decent oranges. Natoora’s Extra Large Leafy Sicilian Oranges from Ocado are some of the best tasting oranges I’ve had in years, so I decided to use those for this recipe. The recipe calls for eight oranges. There are only two of us, and these are quite large oranges, so I compromised and used six. I have no doubt they will all get eaten. Now, this recipe has a downside. The first step is one of the most tedious things I’ve ever had to do in the pursuit of a good meal. Remove the zest of three of the oranges, avoiding the white pith, and cut into thin julienne strips. The only practical way I’ve found to do this is painstakingly with a small paring knife. It takes forever, but the results are well worth it. So, I set to. 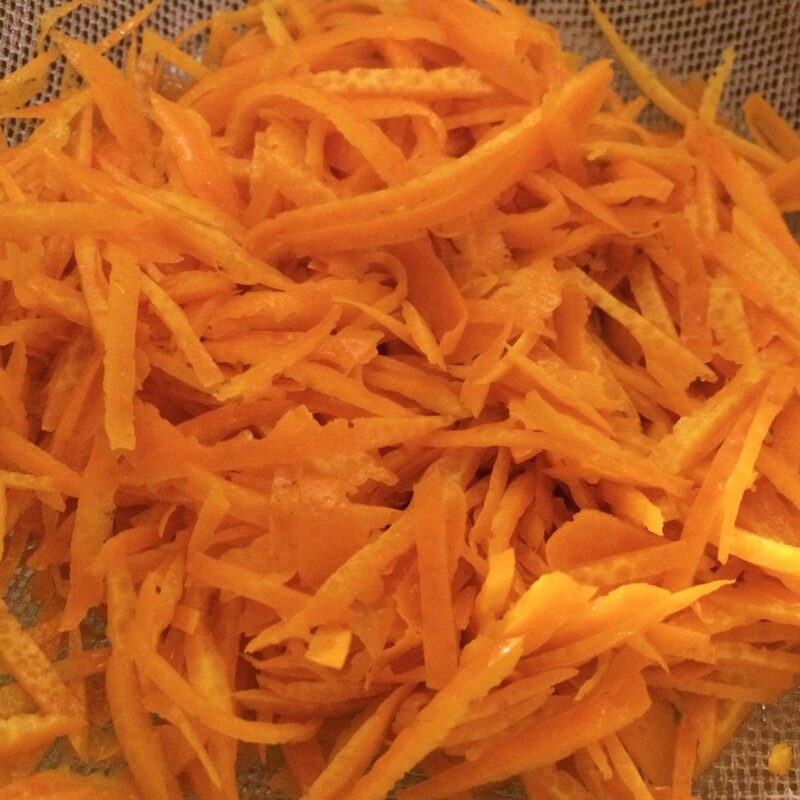 A little while later, I have a mound of julienned orange zest. This gets quickly blanched in boiling water, refreshed in cold water then set to one side. Next, the oranges. 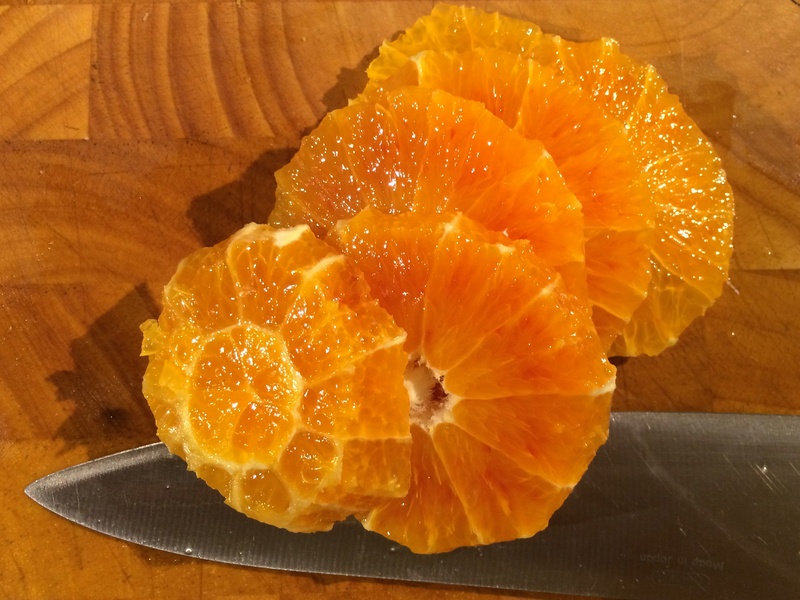 Using a sharp knife, I remove all of the skin and white pith. 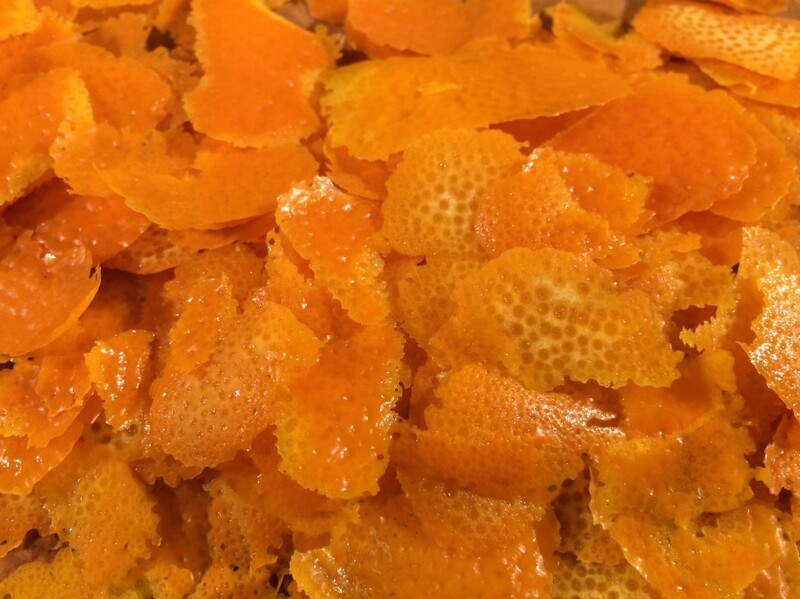 Each orange is then cut into horizontal slices, then re-assembled and held together with a couple of cocktail sticks. 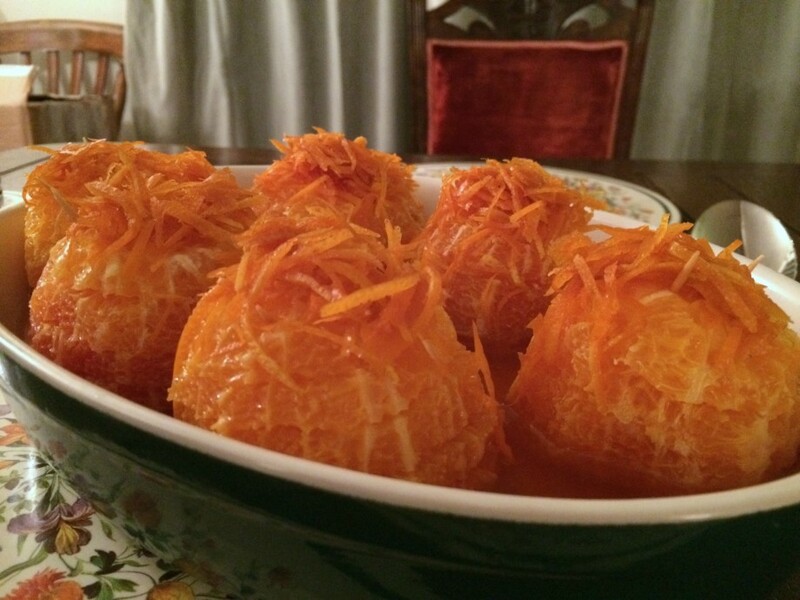 The oranges are then placed in a serving dish, and a little Grand Marnier poured over each one. Finally, the caramel. 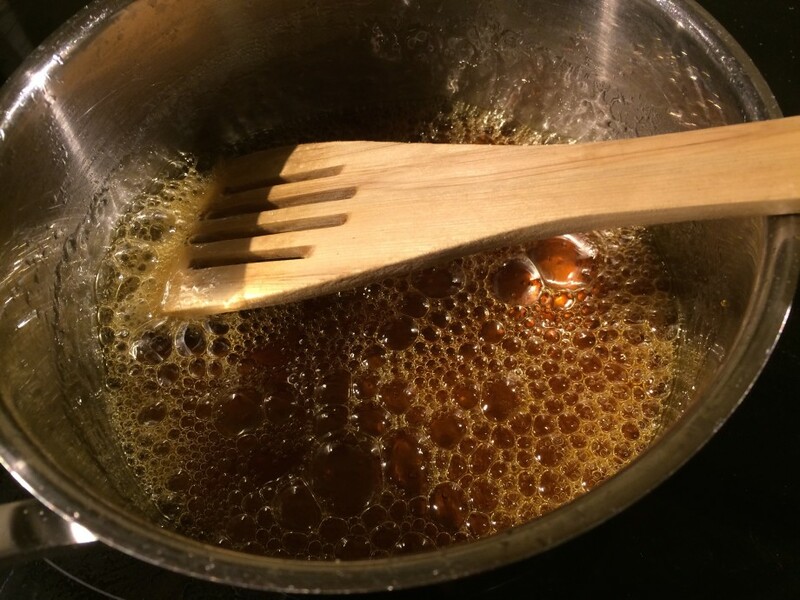 The process is straightforward: make a sugar syrup and then let it boil until it starts to caramelise. After a few minutes of boiling, the syrup started to take on the rich amber colour I was looking for. I rummaged around for my phone – I needed to take a photo of this stage of the process. I eventually found it hiding under the recipe book. The photo took a couple of attempts, the lens was steamed up, but I eventually had my picture. I then added hot water to the caramel, let it splutter, and returned to the heat to finish off. Hmm, something wasn’t quite right. It looked rather darker than usual. This wasn’t the rich amber colour I usually had; this was a darkish brown. I took a spoonful, cooled it in some water, and tasted. Yup, I had burnt the caramel. I realised what had happened: whilst I was fannying around looking for my phone, the caramel had continued to cook, and started to burn. It wasn’t very burnt, but it certainly wasn’t the flavour I was looking for here. Oh well, there was only one thing for it. I discarded the caramel, and washed out the pan ready to start again. Well, lesson learned. Next time I’m doing something that’s potentially time-critical, we’ll have to forego the photos. So, round two. I made fresh sugar syrup, and boiled it until amber in colour. This time I didn’t wait to take a photo, I immediately took it off the heat and added the hot water. This looked more like it. Back on the heat with it, I added the orange zest, simmered for a few minutes and then poured the caramel over the oranges. The oranges then went into the fridge, ready for the next day. Sunday afternoon: time to get the main course underway. The Prawn Cocktail Years’ spaghetti bolognese is one of those recipes that I’ve looked at many times over the years, thinking “that looks interesting”, but have never actually got around to making. 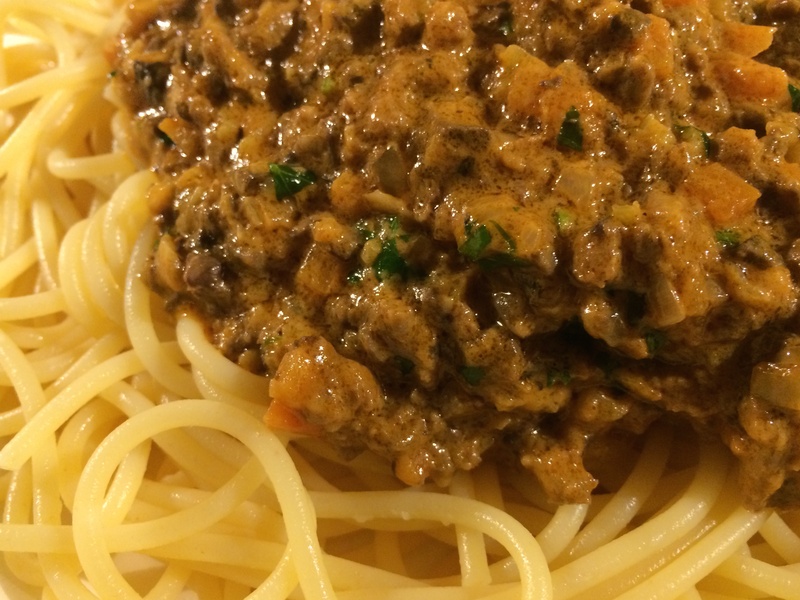 It’s not like any other bolognese recipe I’ve ever made – it has cream in it for a start. I’ve never put cream in a bolognese before. Well, there has to be a first time for everything. Here goes! First of all, I measure out all the ingredients and finely chop all the vegetables. All that chopping seems to take forever, but finally it’s done. Now for the actual cooking.To start, cook the onion in butter until soft, then add celery, mushrooms, carrots and garlic. 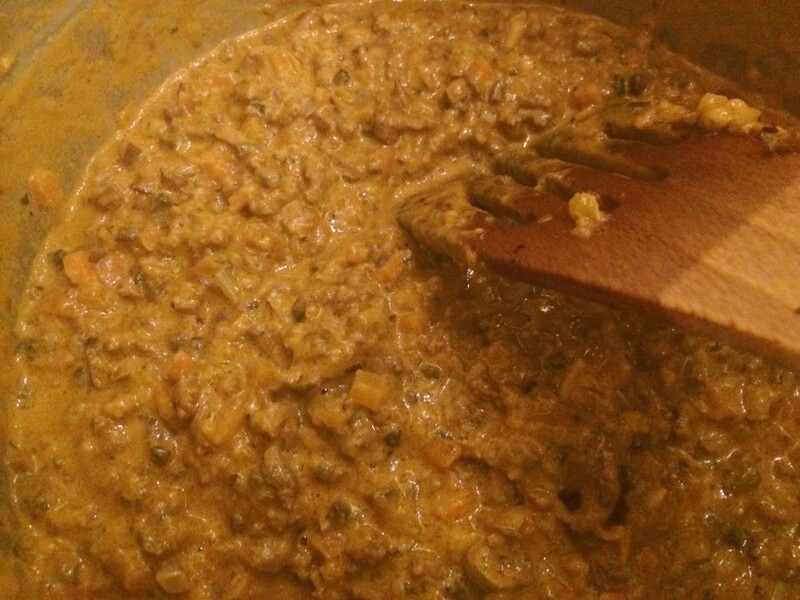 Carrots in a bolognese? OK. In they all go. Cook for a few more minutes then add the minced beef. Cook that until beef cooked through and broken into small pieces, then add chicken livers and white wine, letting the wine reduce to almost nothing. Next, add some seasonings – salt, pepper, nutmeg, and then some passata. This seemed a very small amount of passata – I’d usually add much more tomato that this to a bolognese. Oh well, I’m simply doing what I’m told here. Bring back to a simmer and turn the heat down very low – the sauce was barely blipping. I left it like that for around an hour and a half, stirring occasionally. It smelled delicious, so I tasted it. It tasted delicious. 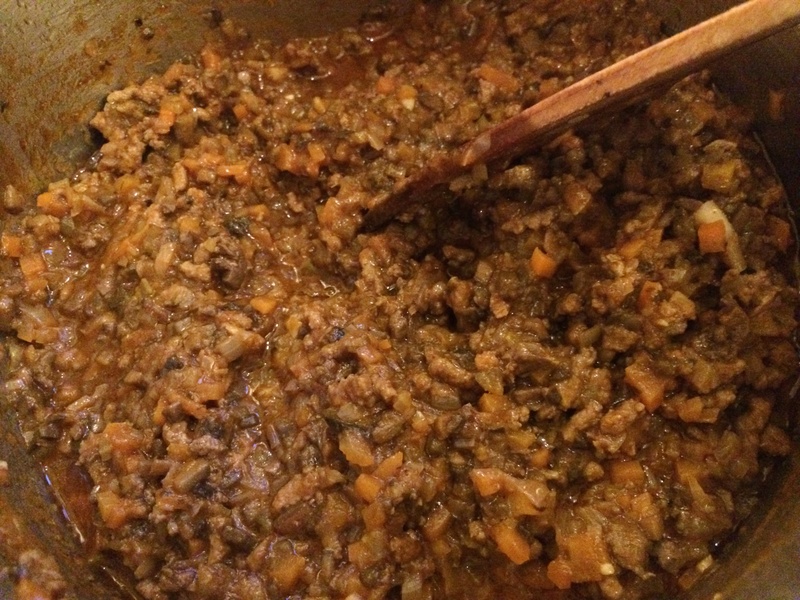 That would be a perfect bolognese sauce exactly as it was, yet we weren’t finished yet. I have to add the cream. I’m still not convinced that cream is the right thing here, but that’s what the book says. OK, so I add cream and simmer gently for another thirty minutes. Now the recipe tells me to add yet more cream, and simmer for a further thirty minutes. Well, in for a penny, in for a pound. I add the cream. Thirty minutes later, the bolognese is still very wet and sloppy, and looks very creamy. I tasted it – it was still nice, but the cream seemed a bit much. I still wasn’t at all convinced. I decided it was too wet still, and turned the heat up a little and simmered for a while longer to reduce some of the creamy liquid. OK, finally the bolognese seemed ready. A lot of the liquid had now gone and it looked much better for it. I tasted. It was nice. The creaminess was still there, but it had mellowed a lot. This was now really rather good. Final step: I cooked some spaghetti, stirred some chopped parsley into the bolognese and served. The cow pats were really very tasty. The spaghetti was cooked perfectly, and the bolognese sauce was, well, I can only say “delicious”. My reservations about the cream were unfounded, it made an excellent addition. For dessert, we had the oranges in caramel (well, two of the oranges), with a little double cream poured over. I always like this recipe, and this time was no exception. 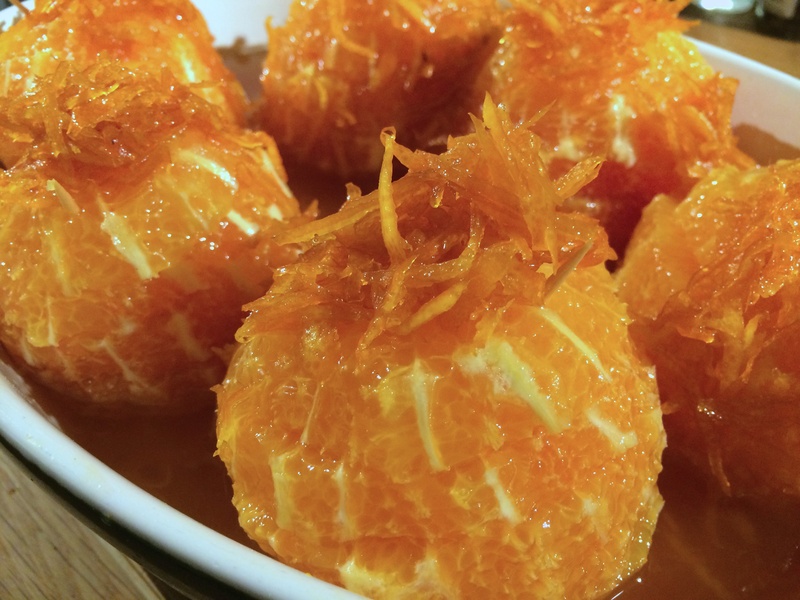 It’s a light and refreshing end to the meal, and these oranges were deliciously sweet and juicy. All in all, I think the night’s meal was a success. 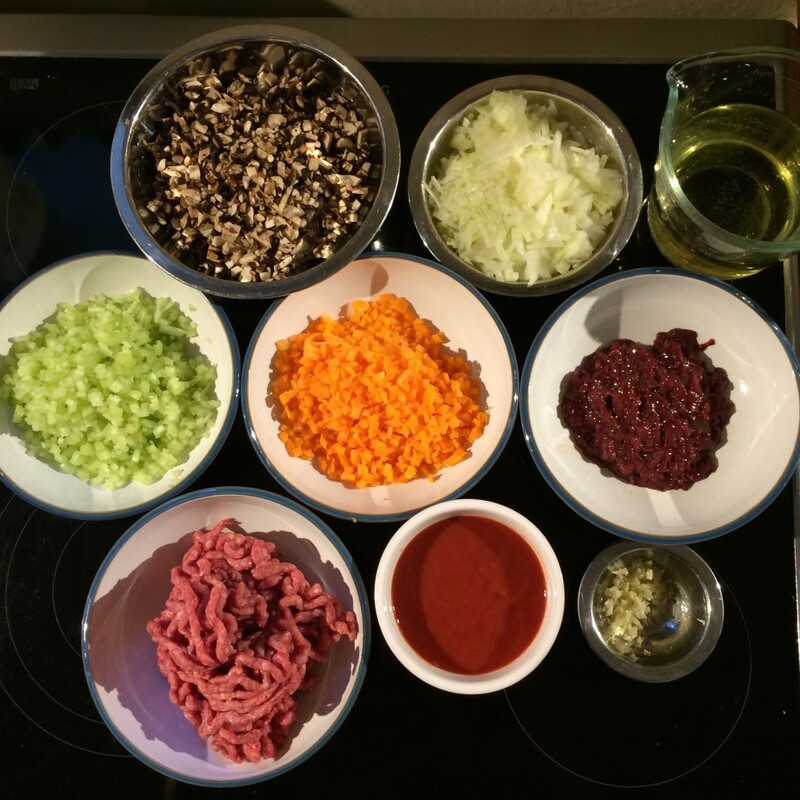 Spaghetti Bolognese – unlike any I’ve had before! The first thing I noticed was that it was a largely brown colour, whereas the standard Bolognese is often quite red with tomatoes. Next the aroma was nothing like the tomato/oregano I’m used to, but instead it was meaty and rich. Taste – delightful, a creamy meat stew with the creamy taste and texture of chicken livers. The mixture was quite firm, not sloppy. The meats and veg, all cut tiny by hand, had a great texture. Quite simply the best Bolognese I’ve eaten. The spaghetti was my first in 2 years and it was perfectly al dente. I love spaghetti when it’s al dente. 10/10 – sorry, nothing to improve. Dave loves this recipe, he’s done it several times before. That doesn’t mean it’s not lovely, it is. Simple, succulent and intensely orange. Chilled from the fridge after a suitable break from dinner. 9/10 – because he will assume I am not discerning if I don’t. This is one of those dishes I order in restaurants but never prepare at home. I’m skeptical about the carrots, but I like the proportion of tomato. I may try this. 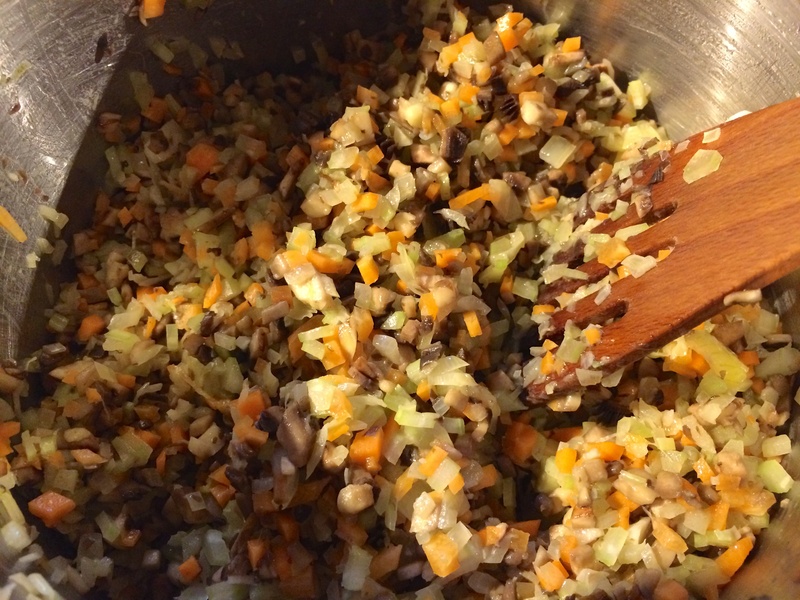 I have been putting carrots in my Bolognese for over 20 years! I have Bolognese recipes containing carrots from Rachel Allen, Louse Walker, Ainsley Harriet and Jamie Oliver, not to mention the Dairy Book of Home Cookery from the 80s. There are no carrots in my Delia Smith and Gordon Ramsay recipes but a quick Google search suggests that they would be included in an authentic Bolognese. I would also be skeptical about the cream but I’d give it a try. Carrots in spag bol are standard where I’m from! Well it’s news to me! They were pretty good though. See, for years, you’ve probably been able to make a better spag bol than me!